When I recently partook an internship at the United Nations in New York, the hot topic of discussion was the Global Financial Crisis (GFC). 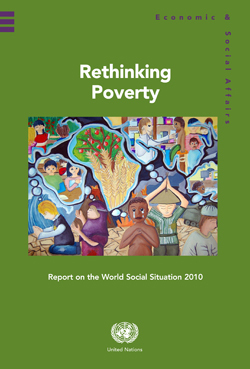 At the UN the discussion was further enlivened by the release of the document, “Rethinking Poverty: Report on the World Social Situation 2010,” by the Department of Economic and Social Affairs, which challenged the economic orthodoxy of the Free Market. In Australia we have just witnessed an election battle where neither party has had the strength of conviction to say anything that opposes received economic orthodoxy. Our previous prime minister, Kevin Rudd, challenged the economic orthodoxy and was abandoned by both parties. Strangely this attitude follows on the heels of the GFC, which was unpredicted by all but the acknowledged unorthodox economists. I would have thought this would have damaged the reputation of economic orthodoxy, especially in light of the Rethinking Poverty report, but it seems the opposite is the case. Paul Krugman is an prime example of an economist having failed to predict the GFC and not losing his reputation or influence on socio-economic policy. The 2008 Nobel prize winner and New York times columnist provided a rather simplistic analysis of where economists went wrong in 2008. He suggested that economists had preferred mathematical beauty to real truth, they had failed to realize that markets and institutions are not perfect and that people often behave irrationally. Krugman remains blind to the fact that the economic view of rationality is a stunted and limp view of the reality of human nature. Recent Popes as well as Catholic Social Teaching have rightly criticized economists for their failure to come to terms with the nature of the human person. Modern economics was conceived during a time when psychology was at a low point in history. The mind was little understood and there was a deep suspicion of mental structures. The Enlightenment’s revolt from the middle ages had rejected the faculty view of the soul. For economics this meant the rejection of the notion of a hierarchy of goods and the development of a utilitarian calculus view of rationality. In more recent times the structured nature of the mind has been rediscovered and the corresponding hierarchy of goods and broader notion of rationality developed. Unfortunately this has not found it’s way into economic theory, which suffers from its sorry origin. Such a hierarchy of Goods (see the works of philosopher Harry Frankfurt) is more powerful and sophisticated than the current needs/wants analysis of modern economists. Krugman and other economists need to acknowledge that modern economics is in need of a major overhaul. This entry was posted in Justice and tagged Catholic Social Teaching, Economic Orthodoxy, economists, GFC, Global Financial Crisis, hierarchy of goods, Kevin Rudd, Paul Krugman, Rethinking Poverty, socio-economic policy, UN. Bookmark the permalink.